Currently, practically all the above network systems rely crucially on the Global Positioning System (GPS), which is a space-based navigational system powered by satellites and precise atomic clocks. Ultimately, GPS is the backbone to all time-synchronized businesses and networks. The radio signals of GPS, however, are weak and can be interrupted or interfered with easily. Therefore our global and vital networks are constantly at risk. Still, we seem to take these risks for granted, the simple reason being that there has been no alternative – until now. 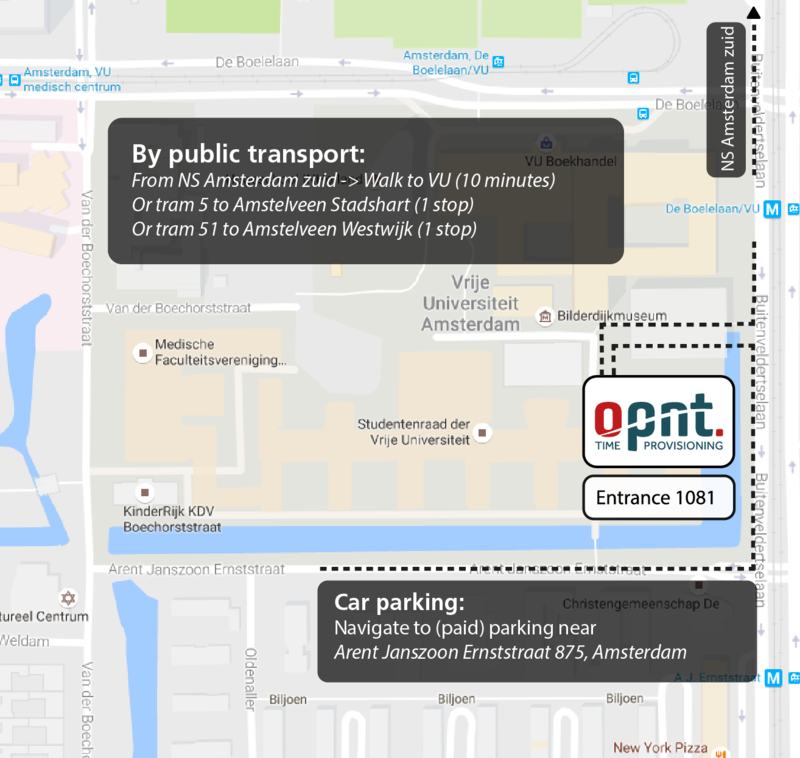 OPNT is a Dutch enterprise which has its roots in the science department of VU University Amsterdam, The Netherlands, where it is located on campus. Since it was founded in early 2014, OPNT has been rapidly expanding, acquiring its own work spaces and a dedicated team of engineers. Since December 2015, business operations of OPNT have been backed by venture capital of Cottonwood Euro Technology Fund. While being a fully independent entity, OPNT has licensed access to highly specialized laboratories and a network of international timing specialists. The mission of OPNT is to relocate all current GPS-based services to ‘from the sky’ to the telecommunication network, thereby opening up the 200 billion euro global market of GPS and GPS-enabled products to developers, managers, and users of telecommunication networks. The solutions of OPNT integrate GPS-quality timing and beyond with the flexibility and reliability of standard telecom equipment. OPNT introduces network-based timing solutions, offering GPS-independent timing with a performance far beyond GPS. These solutions use existing fiber optic communication infrastructure, which makes them virtually impervious to GPS jamming while fully integrating reliable and extremely accurate time transfer in optical networks. Versatile like Ethernet yet more accurate than GPS. OPNT offers state-of-the-art in timing in the form of a simple, flexible and extremely affordable Ethernet solution. Leave your data network untouched. OPNT’s solution works side by side with existing telecommunication equipment, independent of communication protocols. No legacy equipment needs to be upgraded or replaced and no capacity needs to be sacrificed. Sub-nanosecond accuracy, any time, any place. OPNT’s solution provides the most accurate network timing currently available on the market, providing sub-nanosecond accuracy in any network, from local to long haul (long distance). By implementing the OPNT-service into an existing fiber optic network both the investment and the operational costs are reduced extensively compared to current systems. The end user as well as the network owner can profit from this. With the growing concern of governments and legislators about the vulnerability and overreliance on GPS timing, 4G and 5G network operators can now move to a GPS-independent network synchronization solution. OPNT’s solution provides any existing network with a unique synchronization feature which distributes a uniform time base that is under your own control. Simply place OPNT’s timing switches in those locations where timing is needed (base stations, datacenters, subways, power plants and synchrophasors). Connecting only one of the nodes to a reference clock will result into exact replicas of the reference clock in each timing node – fully automatic and maintenance-free. Owing to its high accuracy and flexibility, OPNT’s solution is the only technology that is suitable to serve as a backbone for future enhanced terrestrial positioning systems which will outperform satellite-based positioning systems. Is your enterprise ready for OPNT? Are you in need of a reliable and cost-effective GPS back-up system for your optical network infrastructure? Do you need GPS-quality timing in places where GPS is not available? Are you looking for a sub-nanosecond network synchronization over distances in excess of 100km? Do you require accurate and reliable timing in your network in a way which adds -rather than consumes- optical communication bandwidth and performance?